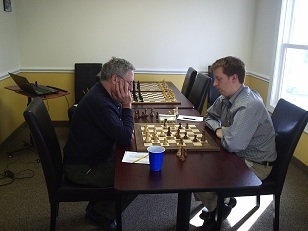 This Sunday, 2013 CT State Champion NM Ian Harris and 2012 CT State Champion NM Gary Shure faced off in a 1-v-1 two game match. Harris took an early lead after an opening error cost Shure the first game very quickly. Without delay they launched into the second game. This time there would be no quick result. Shure got the upper hand in the middlegame and Harris soon succumbed to the pressure. The match finished tied 1 – 1 but stay tuned as a rematch is in the works!